Should you incorporate your Law practice? A PC is incorporated under the Ontario Business Corporation Act (the “OBCA”) as a regular corporation. However, a PC is governed by the Law Society Act. Generally the OBCA provides that all of the shares must be owned directly or indirectly by members of the specific profession. The officers and directors of a professional corporation must be members of the profession. The name of the PC must include the words “Professional Corporation” in English or French. Further the name must comply with all other requirements of your profession. The original OBCA legislation prohibited the accumulation and investment of excess earnings by the Professional Corporation (PC). The rules have now been changed to allow for the accumulation and investment of the surplus funds. The Law Society of Upper Canada requires a non-refundable application fee in the amount of $250 + GST be submitted along with the Application for Certificate of Authorization. An annual renewal fee in the amount of $75 + GST must be submitted along with each Application for Renewal of Certificate of Authorization no later than 90 days before the December 31st expiry each year. The only other costs associated with a PC are the annual administrative and accounting costs of maintaining the corporation. 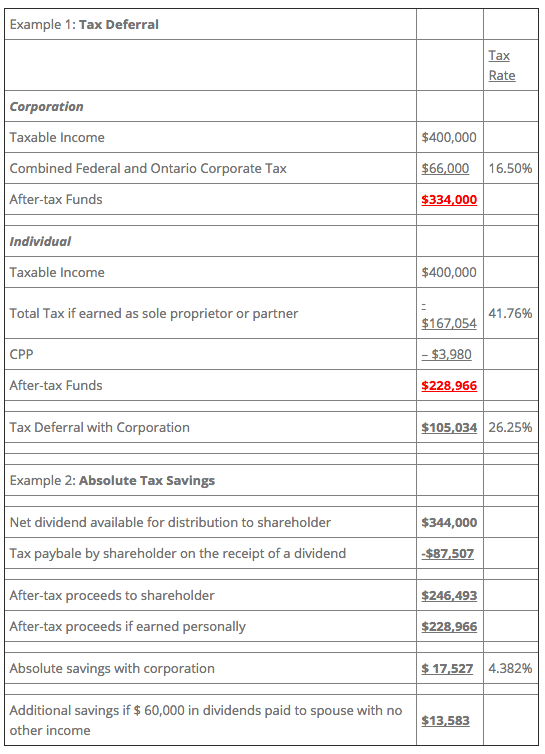 The tax rate paid by a corporation qualifying for the Small Business Deduction in Ontario is approximately 16% compared to the top marginal tax rate of 45%. Where the funds are needed by the professional for personal purposes or to fund the operations of the business, the professional will enjoy a substantial deferral of income tax. Further significant savings can be had if the lawyer defers the withdrawal of the funds until retirement since it is likely that the lawyer’s tax rate in retirement will be lower than the current tax rate. The net after tax income in the PC will be paid out as a dividend, which will be taxed in the professional’s hands. The next level of tax, at the professional’s personal rate, should bring the total tax up to the total of 46.41%, or the amount that would have been paid had the professional earned the income directly; fortunately there is actually a savings of about 4% when earning your income through a corporation compared to earning it directly. Therefore, on income up to $ 400,000, the professional could save over $ 17,000 in income tax. The professional will often accumulate the excess income in the corporation and wind down the corporation in his or her retirement, withdrawing the retained earnings at a even lower tax rate. If the income of the corporation is less than $ 500,000, there will be no need to pay a salary to the professional; therefore there will be no CPP contributions. The annual saving is about $ 4,000. Unfortunately though, the professional may not have a full pension from CPP upon retirement. We would suggest contributing this savings into a Tax Free Savings Account. Since part of the tax plan usually replaces salary with dividends; the professional may not have any earned income, which in turn means that he or she will not have any RSP contribution room. By being able to incorporate, this provides the professional with the ability to sell his or her interest in the practice as shares, which means up to $ 750,000 of tax free income. The professional will be able defer the tax payments for current income for up to a year. In simple terms, by transferring your income to the new corporation for the current year you could reduce the personal tax you need to pay during the year of incorporation to zero. That means no installments for the current year. This is just a deferral. The corporation will pay tax three months after its year end and will need to start paying installments. The corporate tax rate could be as low as 16%. The balance of the deferred income will not be payable until you eventually take the money out of the company, which depending on your cash needs could wait until retirement. If the practice has goodwill attached to it, then, it would be possible to sell the goodwill to the new corporation and receive another tax incentive. You would sell the goodwill to the new corporation at a price at or below fair market value. This would create a capital gain to the vendor’s. As the maximum tax rate on a capital gain is 23%. This effectively reduce the lawyer’s rate of tax on what would have been a dividend from 31% to 23%. If the value of goodwill was $500,000, the approximate tax saving would be $ 40,000. An additional benefit would be that the corporation would be able to amortize the net tax cost value (50%) at 7% per annum. This would save the now have a depreciable asset. Goodwill purchased for $ 500,000 would produce a tax asset of $ 250,000 to be written off at a rate of 7% per year. If we assume a corporate tax rate of 16%, this will save the corporation another $ 40,000 over the life of the asset being written off. » Entertainment expense – generally 50% of meals and entertain expense is disallowed as a deduction. If you are at a 45% tax rate, this will cost you 22.5% in lost tax savings. If the expenses are incurred by the corporation at an 16% tax rate, the lost tax savings is only 8%. » Life insurance – generally life insurance is a non-deductible expense. If the life insurance is paid by the corporation, it is still not deductible; however you are using before personal tax dollars, therefore you are still saving the difference between the corporate tax rate of 16% and the total personal tax rate of 46%.